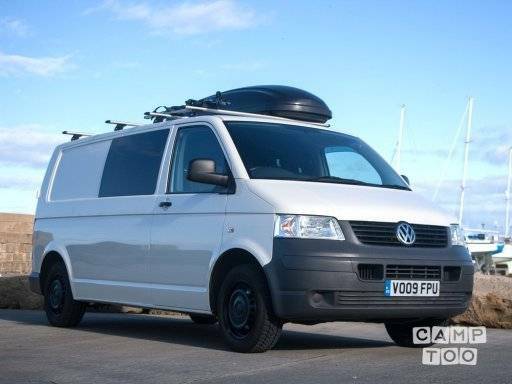 The 'Panda Bus' is an easy to drive, fuel efficient VW T5 Transporter. She is a long wheel base model, fully converted to a high standard. A comfy ¾ width rear sofa folds flat via a ‘rock and roll system’ to create a full-width bed which easily sleeps, 2 adults and 1 child. The bed has a memory foam double mattress topper offering luxurious comfort and there’s privacy curtains all round! She is fully insulated to keep heat in and cold out! Warming you up after a day in the great outdoors is easy- and efficient Webasto ‘air blown’ heater will blow your socks off (or at least dry them)! When stationary, the front double seat turns around 180 degrees to face the living area which creates a spacious and comfortable living space. She’s easy to drive (power steering is great) and offers air con, electric windows/mirrors and a CD/Radio! You’ll need to be between the ages of 23 and 75 to hire our camper vans. Remember: Take only memories – leave only footprints! Je kan de camper ophalen in bij Magnus. Je kan je auto hier gratis parkeren.